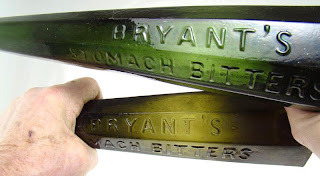 Recently several Bryant's Stomach Bitters bottles were unearthed in a Sacramento privy. Although very exciting news for the bottle collecting world, it really shouldn't come as a surprise to a lot of advanced western diggers/collectors . 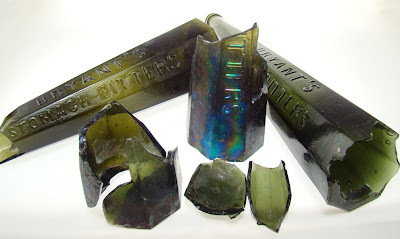 The Bryant's bitters in both mould shapes was advertised in the Sacramento Daily Union newspaper as well as the San Francisco Alta California newspaper. Several examples in various conditions were found in both these cities as one would expect with the products advertising for use in such establishments as hotels and restaurants. Over the years diggers have found the cone style Bryants bottles in places such as North San Juan, Camptonville, Downieville, San Francisco, Sacramento, Ukiah, Saratoga, Mount Shasta area and Carson City, as well as back east in Connecticut. In one San Francisco auction company alone were 25 cases of this early Bryants Bitters being wholesaled in 1859. The early Bryant's bottles were packed 24 to a case, indicating that 600 of these bottles were sold by this auction house alone. As with a lot of other eastern products being shipped to a relatively young market out west it faced competition from other similar products being marketed at the same time, such as Roback's Stomach Bitters, Turner's Forest Wine Bitters, and Hostetter's Stomach Bitters, which were all advertised during this time. With the number of shards found by diggers over the years, there should be enough to piece together several more of the cone style Bryant's Stomach Bitters for future collections.